Neatly Stacked of course - our woodstore. The shortest day came and went and resulted in a positive change in the weather. For the past few days we have had bright sunshine and daytime temperatures of 21 degrees C. The garden is still very wet and a few days of strong sunshine and breeze will help to dry out the soil and begin to warm the earth as spring approaches. Energy has become an everyday consideration in our lives here in Toriello. As a part of our endeavours to remain environmentally friendly and as sustainable as possible we have started collecting wood from the beaches to burn in the workshop. We have just received a delivery of wood for the house woodburner and taken advantage of the low fuel prices to stock up our supply of diesel for the central heating boiler....although we prefer where possible to use the woodburner. We are pleased with the delivery of wood as it contains a good mix of ash, oak, beech and birch.....hardly any eucalyptus which is good as it doesn't burn that efficiently. In addition to the woodburner we use the sun and the south facing aspect of the house to gain most advantage of the warmth where possible. This winter has seen us install added insulation to doors and windows to reduce drafts and keep the house warmer for longer. The energy considerations in the garden range from ensuring vegetables are planted in the correct position for light, heat and sunshine, to maximising the soil's fertility by adding organic matter when and where possible. We compost all vegetable and garden waste, add woodash from the fires, collect and compost leaves for leaf mould and of course......add manure, kindly delivered by our farmer neighbour and friend Luis (yes another one) or his son Luis (yes, yet another one).We continue to build up our stocks of organic matter and continue to look for additional sources. This year Luis (the one and only) has added barrowloads of roadside dirt to the flower beds and it has improved the soil no-end. It sounds bizzare - roadside dirt but it comprises of a good blend grit, sand and organic matter that has collected over the years and only serves to narrow the lanes and play host to many weeds. The network of country lanes around our area are mostly narrow and without names - here they are known as caminos. It has only been for the past 20 or so years that most of these lanes have had a proper road surface. As we await the spring energies from the sunshine and longer daytime periods we have started to think about crop rotation, varities and range of vegetable and salad crops to ensure we make the most of our space and abilities........We are looking forward to be able to get out into the garden and begin the work. We wish you a very Happy Christmas, Good Health and Prosperity in your adventures in 2009. Winter beckons: wild and windy weather, hail and rain, cold and damp. The garden is wet with leaves collecting in borders and in hedges: awaiting gathering to add to our leaf mould. The woodburner beckons around mid-afternoon and provides some welcome warmth and comfort. Snow has hit the nearby mountains which glow bright in the rare glimpse of midday sun. Luis has returned from a week away in Barrios de la Vega at his family home (processing piggies). Laden up as usual with fruit, vegetables various cuts of meat and collection of metal rods to build plant frames to prevent our citrus from strong winds and salty sea mists. With lots of winter vegetables in the garden it is an ideal time to make substantial vegetable based soups, broths and casseroles - home made bread - a glass of wine......perfect. The cats spend more time indoors but soon get restless and venture out to hunt and stalk. Walks out have been shorter and less frequent. We have identified a good source of mistletoe to collect nearer Christmas - it grows in abundance here on old apple trees. Although parasitic, we will attempt to introduce it to one of our older trees in the hope it will colonise and grow. Earlier this Summer, we decided to grow various varieties of tomatoes to see which one performed better in the Asturian climate. The main problem with the climate when growing tomatoes is the high humidity levels and sea mist that result in the blight. We planted 4 different types, two named (royal chico and siletz) together with two generic types, one bought locally and the other bought in Castilla. Home grown tomatoes are really worth the effort because of the superior taste when compared with comercially grown ones that are as far removed from organic as they can be. The results of the Asturian jury in terms of the tomato trials are as follows: all four varieties succumbed to the blight. It was the siletz variety that was slightly more resistant but it lacked taste and texture. Next year we shall try further varieties and hope to have a little more success. It is a good job that my sister Rita has a glut of toms with 130 plants, at least we got some supplies to make tomato sauce and pisto -a tomato based sauce made with peppers, marrow, pumpkin, onion, aubergine and garlic. Other than the disappointing results from the tomatoes, the vegetable and fruit garden have produced an abundance of crops throughtout Summer and will continue to do so well into Winter. This week I sowed carrots, turnips and salad leaves. The weather remains very pleasant with days turning sunny and warm with plenty of sunshine but usually after early morning mist and heavy dew. The past few weeks have been really busy with visitors Sue, Sam and Lucy May, harvesting, injuries, jobs around the plot and avoiding the summer madness in town. We had a good time when Sue et al came over for 5 days at the end of August. The weather was reasonable but a little too much seaweed to make swimming in the sea an option - although we did manage a knee deep paddle. Earlier storms had decorated the normally golden beaches, with deep red seaweed that formed meter high mounds - most unusual for the time of year. Harvest time has arrived again with the vegetable garden producing many crops that all need processing and/or eating. We have been busy making Jam (from foraged blackberries and windfall apples), Chutney (various types) Piccalilli, Tomato Frito and Pisto (tomato, marrow, onion, pumpkin, aubergine and peppers). It is good to see the shelves full again and nice to know that we have supplies that will last us well into next year. Luis went to his Sister's for a week and I stayed behind to l.ook after the cats and the garden. All went well until I took a walk along the camino with Indiana Jones and Lara Croft (you know who you are!!!). I slipped when pole vaulting a wall and badly sprained my ankle - oouch! Healing well and begining to weight bear. Asturias and town have been very busy and buzzing over August (the main holiday season here) and it is good to see it reverting to its quieter and tranquil hum. Luis will report on the tomato trials in a later post in the mean time a few photos for you include scenes from a local fiesta and street market. 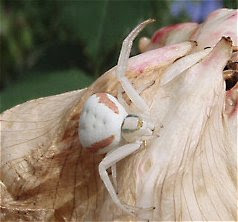 Since moving to Spain we have been lucky enough to see many plants, animals and insects that we would normally have seen. Some of these we have managed to photograph whilst others evade our attempts and stay well clear of cameras. We often hear and see Deer grazing in the field beolow our garden and Wentwoth and Gawber can often be seen mingling with them hunting for mice and shrews. We have many owls and birds of prey including buzzards, kites and vultures. Birdlife in general is growing since we have attempted to encourage seed heads and insect life - keeping our plot as diverse as possible with different habitats and natural areas that encourage their visits. A small slideshow has been placed above this posting. As you may be aware, I recently started experimenting with making pebble mosaics using the indirect method and the results have been very good. We collect the pebbles from the local beaches, good hunting grounds for different sizes and colours. I perfected the technique and recently had an opportunity to show Rita and Alfredo, during their visit to La Pasera, how to make this type of mosaic- they are familiar with making mosaics as the romans used to do applying the "opus tessellatum" method. Those of you who have visited us may have noticed, on our living room wall, the mosaic they made for us. The picture of the mosaic shown is part of a set that will be used as a series of stepping stones leading onto the garden tap. The weather remains mixed and the rainfall is less, we were able to take the hammock out for a few days. In the vegetable garden, the salad crops, mongetout, beetroot, leeks, rhubarb, spinach and courgettes are doing very well but some of the casualties of the wet weather such as the onions are not doing very well and we may loose the entire crop if the wet weather persists. I have almost given up the thought of sowing more french beans as this crop likes hot and drier conditions. The tomatoes this year are doing well in spite of a rocky start. We are running a trial to see if two varieties of blight resistant tomatoes bought in the UK out-perform the local varieties. Last year by now we had lost all the tomato plants. Well spring has been here with gusto........plenty of rain, sunshine, distant storms and cool winds. The plants and trees have sprung into full bloom, apple blossom is in abundance and the birds are busy feeding their young. My Dad has been with us for a week and enjoyed it despite the rain. We ventured to Barrios de la Vega near Saldaña to have lunch with Rita, Alfredo and the family, travelling through one of the passes in the Picos de Europa Mountains on to Riaño and down through Guardo. With the weather like it was we also took the opportunity to visit the Tito Bustillo Cave complex in Ribadesella. Cave paintings dating back to between 15,000 BC to 30,000 BC are still evident and offer an insight into the lives and minds of our ancestors. We came across this little fella (Adder) whilst out walking on the Camino de Santiago - actually a little female about 45cms long and making hissing noises. Luis, of course yelled out (not his favourite reptile). Plenty of ongoing projects in hand including: gardening and growing vegetables; building work for the garden; hedge planting and making; collecting driftwood to burn; looking after the cats. The village has once again celebrated its fiesta by parading the Statue of Fatima through the lanes in procession with Rockets, bagpipes and drums, villagers in traditional costume and tambourines. The fiesta culminated in free octopus and fried potatoes served in a large Marquee. Two bands played upbeat but dated music until 5am in the morning - a good time was had by all. Luis forgot to add that after the christening they throw sweets to the waiting children and adults from the village. 50kgs ready for the feast. As April is coming to an end, I will let you know the latest in our life. First of all, many thanks for my birthday cards, we had a very nice day, my treat. We visited the pre-romanenque church of Santa Maria de Valdedios from the IXth century containing some remnants of wall paintings from that preiod. We also visited the monastery of San Juan de Valdedios (XII), both set in the beautiful valley of Valdedios. I intend to return to the monastery to hear the monks singing the mass service in gregorian. After this cultural visit, we travelled to Gijon were we were blessed with very nice weather and after a lovely lunch at the vegetarian restaurant, we went for a coastal walk. We have just returned from Barrios after spending the weekend to attend Laura´s christening (my new niece) on Saturday 26th, the baby was very happy both during the service and at the banquet. On the Sunday all the family gathered together as there was a fiesta in Barrios over the weekend- for those of you who do not know, Barrios is my family´s village. In the vegggie plot things are happening fast, last week we made a salad with all our own home produce, it included lamb´s and oak leave lettuce, spinach, radishes, onion and beetroot. It gave me a great deal of pleasure to go down the plot and pick the veg just before preparing them. We are not self-suffient regarding veggies but it is very satisfying to eat a freshly prepared meal with orgnanic home produce. This also enables us not only to eat healthy veg but also to reduce our carbon footprint- more on ways in which we aim to lead a greener life in future entries. The garden is changing almost weekly and the latest additions include a hedge we just planted today with small tree plants of hawthorne and blackthorne that hopefully will encourage more wild life in our plot. The bog garden is the home of a big toad that will help reduce the slug and snail population as we have decided not to use slug pellets, instead we use coffee grounds, egg shells and ash as well as planting a few extra. Asturias is not known for its facilities outside of the towns and cities, unless that is you happen to spot a small bar nestled in the corner of a sleepy village........don't count on it being open. Coming home one night last week Luis asked me if I could stop on the verge so he could make a call if you know what I mean. Out he stepped into the darkness, the stars above twinkling brightly, when a grunt and a scream was heard. Along the way he had found a nettle free spot complete with resident Wild Boar. I will let you work it out which one grunted. We are making progress in the garden with some of the hard landscaping and a couple of new beds. Luis is working hard on the vegetable garden and painting the wood work, the kittens are growing well and enjoying the boom in mice and shrews at this time of year. They enjoy playfighting as the sun goes down, ready for their food around 8pm. The coast is interesting at this time of year with low and high tides bringing tons of driftwood and fallen trees and branches onto the beaches. Rough seas have once again given us a great show down on at the blowholes in Gaudamia. Ribadesella remains quiet with a few extra tourists at weekends and bank holidays. We have commenced my favourite month of the year, April, with Ian´s return from the UK where he spent a busy time. I stayed behind at La Pasera with Gawber and nursing Wentworth who has now returned to full health after been very poorly. He ended spending the night in hospital and we feared that he might have been poisoned accidentally when we gave him some flea treatment that we have used in the past. The flea drops were Bob Martins Spot On, needless to say that we shall not used this particular brand again as it is notorious for causing harm including the death of people's cats- the accompaning literature did not mention how harmful it can be, we only realised it once Wentworth bacame unwell and after checking the chemicals over the Internet. Use this at your peril. Wentworth´s health was further complicated few days after being discharged when he had a bad abcess on his tail resulting from an earlier fight with a local cat. Both cats are now back to normal and being such good hunters, gawber still hunts more than Wentworth and it is Wentworth the one with a taste for meat. The weather is unsettled and changeable at present. I hope that the windy and wet spell we had in the last two weeks in March is now over. The cherry blossom this year was a lesser show than the previous due to the two weeks arround Easter when we experienced a cold spell with heavy rain, strong winds, storms and hailstone. The vegetable plot benefitted with the moisture as the soil was rather dry. We were able to fill up the water tubs with the rain from the shed roof, this water is being used already to water different seeds and young plants and helps us with our efforts at being more environmentally conscious by reducing the use of the hose pipe even when we do not have a drought. 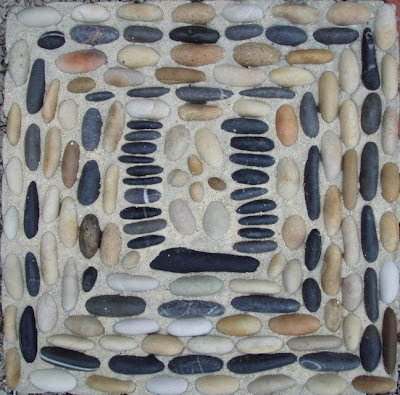 I recently finished making a pebble mosaic using the indirect method, this entails bedding the pebbles on a bit of dry sand until you have finished the desired design and before filling the mould up to the top with mortar and once dry you turn it upside down, if there are any mistakes, you need to live with them but unfortunately I was far too impatient to see the results of the new technique and it broke in two pieces coming out of the mould. We will be able to repair and use somewhere in the garden. In the vegetable plot, we continue to enjoy a variety of vegetables and this years sowings are starting to delight out meals, at present the baby radishes and early sprouting broccoli are very tasty. After what it felt like a very short Winter but much colder and with more ground frosts than last year, we had some very nice weather which has caused many wild flowers to come into blossom such as the hepaticas, aconites and heliborres. It has been very nice with hot sunny days that felt much like Spring. We have now made a start on the patio base and steps that lead down from the house. We are proud of the brick work (Bob S. and Terry M. would be proud of their pupils!) . Not like the ones in the picture below which me made for Gawber and Wentworth to go up onto the shed roof. What a nice vantage point for them. The veggie plot starts showing signs of new life with seedlings of carrots, spring onion, spinach, lambs lettuce and radishes. We are still continuing to harvest two types of lettuce, leaks, cabbage and early sprouting purple broccoli just starting to crop. The potatoes are in but showing no signs of life. In this area most of the locals follow the phases of the moon as a planting guide that we do not always follow. One of our friends in the village, Manolo, has helped me to graft a wild cherry tree in the garden with some dark juicy cherries - an old variety. We now have horses in the bottom field and calves nearby, nice sound of bells in the morning to accompany the early morning chorus - lovely.We recently went otter spotting in the river Piloña at Arriondas. It was an interesting evening but not an otter in sight, better luck next time. The weather continues to be warm and sunny throughout the day with cool evenings and early morning frosts. Spring flowers are coming though in abundance with swathes of Aconites, Primroses, Hepaticas, Hellebores and Violas. The vegetable beds are full of oats at the moment - this is used as a green manure and also helps to break-up the soil to minimise digging. We are still gathering cauliflowers, leeks, cabbage, sprouts and lettuce with early purple sprouting broccoli beginning to show. Needless to say the freezers are almost full and there is a growing range of produce to 'dip into' should we need to. Wentworth and Gawber are venturing further afield and luckily with no more tree climbing adventures. Mice, voles and lizards are amongst their latest finds........Wentworth usually eats whatever he catches whereas Gawber plays with it then passes it on to Wentworth. We have created a small 'Bog Garden' near the orchard and are planning to make a start on the patio area in the next few days. The fruit trees have been pruned and various beds have been tidied. The past two weeks have been really warm and sunny during the day with cooler evenings and the occasional short-lived shower. We have spent increasing amounts of time in the garden, preparing beds, tidying leaves and pruning fruit trees. Bullocks have been brought to the field at the far end of the garden - the kittens have made good friends with them and often share the same patch of grass. There is a downside though........the local farmer comes every 2-3 days to check on his herd, bringing with him two lively and large dogs. Twice this week we have had to rescue Wentworth from the top of trees, in absolute panic after being confronted with these two hounds. 30 foot up a cherry tree begging a kitten to come down is no joke especially when Gawber spots him and starts to climb the same darn tree. At one stage Luis and I were stood underneath the tree with a sheet held by the four corners shouting "come on Wentworth, Jump." Until we realised what idiots we were.......Ah the joys and responsibilities of pets!